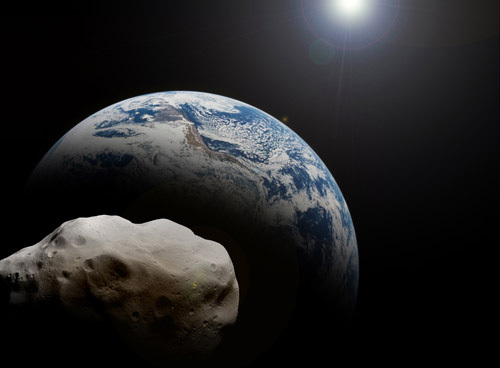 Artist's rendering of a 10-kilometer-wide asteroid on a collision course with Earth. Artwork © Jeff Darling. An Earthlike planet about to be destroyed by a nearby exploding star. 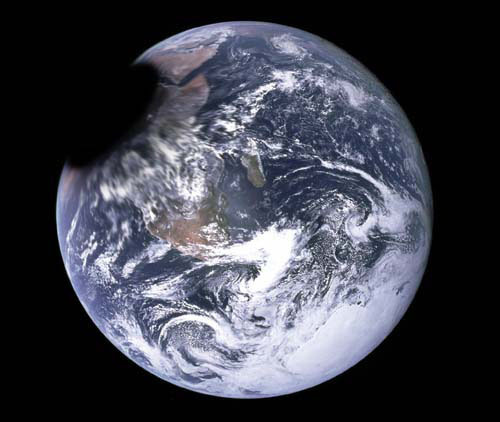 Earth being consumed by a small black hole. All artwork © Jeff Darling. A megacatastrophe is an event of cataclysmic proportions that causes death and destruction, regionally or globally, and may be large enough to threaten the existence of human civilization, all or much of terrestrial life, the Earth itself, or, in some extreme scenarios, the entire universe. Natural megacatastrophes have happened in the past and will inevitably occur again in the future. Added to these is now the potential for artificial or human-caused megacatastrophes. Megacatastrophes in the past have been responsible for some mass extinctions. The most recent of these took place about 65 million years ago and, scientists now agree, was due in large part to the collision with Earth of a sizable asteroid that collided with the Earth in what is now the Yucatan peninsula of Mexico, creating the Chicxulub Crater. 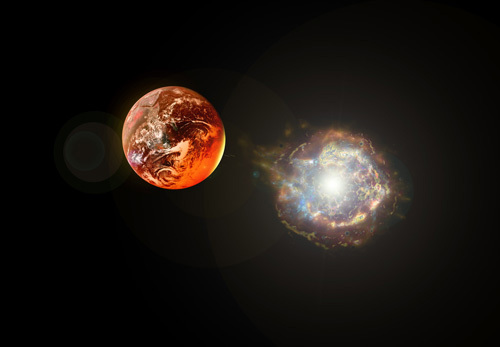 A catastrophe on a vastly larger scale happened in the much more distant past when a Mars-sized planet collided with the Earth and threw out sufficient material to form the Moon. It is a certainty that other asteroids will strike our world in the future unless we find ways to destroy or divert them. Asteroids that may pose a threat to us are known as potentially hazardous asteroids. 1. Asteroids and comets in orbits that could potentially intersect the orbit of the Earth. 2. Collision with other astronomical bodies, such as rogue planets and black holes. 3. Nearby supernovae and gamma-ray bursts. 4. Unusual or anomalous solar activity. 5. Ice ages and other major natural climatic changes, including Snowball Earth events. 6. Reversals in geomagnetic field polarity. 1. 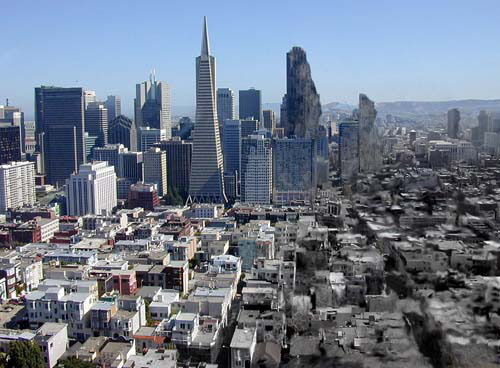 Ecosystem destruction (through artificially-induced climate change, resource depletion, etc). 3. Rise of artificial intelligence. 6. Invasion by an extraterrestrial race.